- a Hindu spiritual and ascetic discipline, a part of which, including breath control, simple meditation, and the adoption of specific bodily postures, is widely practiced for health and relaxation. I first tried yoga on a Sunday evening in my bedroom watching a 20 minute beginners routine on YouTube. I remember the next morning I felt very care-free - along with the feeling of stretched muscles, the first word that came to mind when describing how I felt was 'floaty', you know, like after you've had a full body massage? That’s how much I felt it had impacted me at the time, and the routine was just a few basic poses and some deep breathing! And it was the first time I actually felt the presence of what I could only describe as my soul - which was coming from a me who wasn't spiritual at all! - it felt as if I felt full/whole inside, connected to myself. Whilst living in France (Sept/Dec '14), I had the opportunity to attend yoga classes twice a week. I always came out feeling refreshed, energised and very, very peaceful. I didn't realise I was that tense until I started the lesson and started to feel at ease. Taking time out for yourself like this is so beneficial. It gives you the chance to fully acknowledge and accept the mind-space your are in in that moment and, of course, physically, it helps build and strengthen your muscles too. It brings peace and balance between mind and body and soul. Maybe a big part of it is that you’re doing something solely and mindfully for your present self - by focusing on the here and now, as opposed to worrying about the future or dwelling on the past i.e. when I practise yoga, yoga is all I'm thinking about, my often overthinking mind is slowed right down, it's quiet. I’ve found that the effects of practicing yoga last longer and longer after each session. The mindfulness is carried on throughout my day as well as the aspects of being honest with yourself and others, being kind to your body, keeping an open mind and not comparing yourself to others. My favourite way to describe yoga is 'meditation in motion', because it’s a real cleansing of the mind yet you're obviously still moving your body, so it's great for someone who finds it hard to sit still and meditate. - Improved mindfulness - an awareness and acceptance of one’s thoughts and feelings in the present moment. Yoga can take some patience though. You may feel at first that you’re not feeling these benefits as strongly as you thought you would, maybe you can’t do a certain pose properly or you can’t quite get the hang of meditation - I’ve been there. But that’s why it’s called ‘practicing yoga’, because each time you do, you get better at it! And these benefits will become more and more profound. 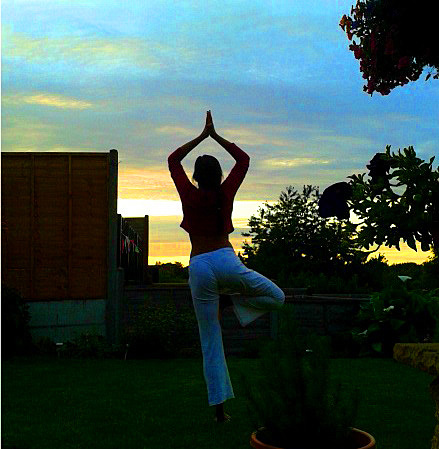 I'm hoping it'll soon become that the feeling I get when practising yoga becomes my norm..!